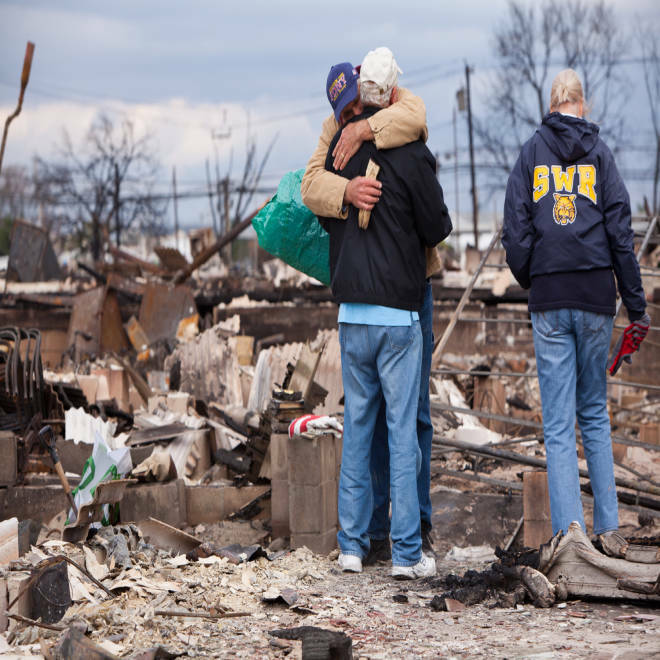 Neighbors Bob Reilly, left, and Jim McGovern embrace among the burned-out remains of their Breezy Point, N.Y., homes on Wednesday. BREEZY POINT, N.Y. — As Hurricane Sandy turned the streets of this community into raging rivers on Monday evening, one company of volunteer firefighters ditched their rescue boats and sought refuge in the community center. Inside they found another bunch of volunteer firefighters, also stranded by rising water, who asked, "Are you here to rescue us?" That was shortly before 70-mph winds blew embers the size of baseballs through the heart of this close-knit community on the Rockaway Peninsula in New York City’s Queens borough. Interviews with residents and firefighters on Wednesday provided a more complete account of how the disaster unfolded in this beachside town when Sandy blasted ashore. 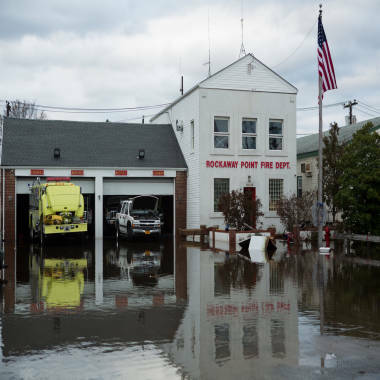 The Rockaway Point Fire Department, one of three volunteer fire houses in Breezy Point, was unable to get its flooded trucks running during the storm. The men took to boats to pull people from the water. 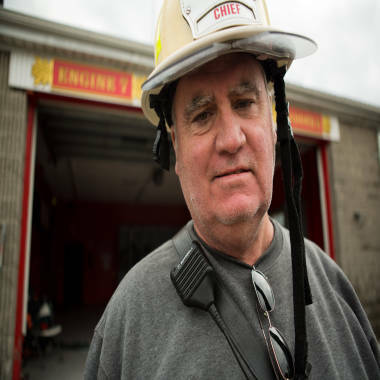 When the water hit about 5:30 p.m., quickly disabling the fire engines and ambulances of the Rockaway Point Fire Department, its volunteers abandoned their firehouse. But when a call came in to rescue a wheelchair-bound elderly woman trapped in a flooded house, Lt. Jimmy Morton and four of his men put on their wetsuits and headed out in two motorboats — a 14-foot inflatable Zodiac and a 15-foot fiberglass Wheeler, steaming up the road into a hurricane. The Breezy Point peninsula was inundated, the waters of the Atlantic Ocean merging with the waters of Jamaica Bay. Electrical transformers arced and sparked in the sky. Streets were disjointed as entire blocks of houses were shifted off their foundations. The winds blew 3-foot waves into the boats. Debris wrapped around the propellers. Finally they had to turn back, ditching their boats at the community center, crawling up a ladder and through a window to safety. They still don’t know what happened to the woman in the wheelchair. 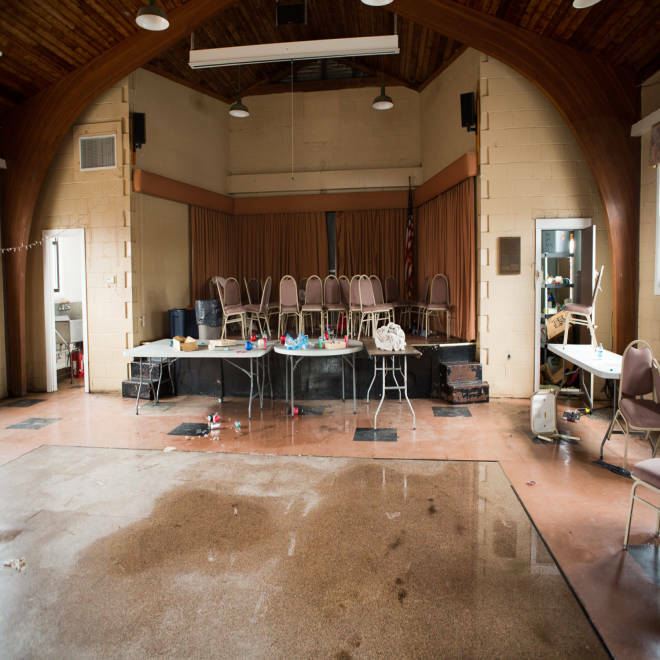 Chairs sit on the elevated stage of The Clubhouse, where Point Breeze Volunteer Fire Chief Marty Ingram and fellow firefighters huddled with rescued residents to escape rising floodwaters from Hurricane Sandy. "I was scared. We all were," Ingram said. "I told everyone, ‘We're beach people. Just imagine it's a summer day and you're standing in three feet of water at the beach, and relax.’" Afraid they would drown when water got higher than the windows, blocking escape, Ingram decided that if the water reached two inches on the stage, the men would take down the Christmas lights strung across the ceiling and use them as a rope line to try to cross the rapidly flowing Point Breeze Avenue to reach a two-story house. He finished a second Our Father, when everyone agreed the water might have receded a little bit. Point Breeze Volunteer Fire Chief Marty Ingram. "I told everyone, 'We're beach people. Just imagine it's a summer day and you're standing in three feet of water at the beach, and relax.'" Everyone knows everyone in the Wedge, often hanging out together at the Sugar Bowl beachfront bar. When a friend once asked Serafin, ‘Do you know Alice” he replied, “Oh, yes. She's my wife's brother's wife's brother's wife." Across a flooded parking lot, Jack O'Meara and his wife, Aileen, were waving flashlights to alert the firefighters. The men from Rockaway got back into their boats, dodging concrete flower pots in the streets. These men — Michael Valentine, Brandon Reilly, Brian Doyle, Michael Kahlau and Jimmy Morton — went back and forth, pulling in family after family, including the O'Mearas, along with their grown children, John and Trish, and their two cats, Leon and Bright. The firefighters plucked more people abandoning Olive Walk ("Life is good," the sign says) and Roosevelt Walk ("walk softly"). The community's third company of volunteers, 10 men from the Volunteer Fire Department of Roxbury at the other end of the point, also saw the glow from the fire, but they, too, were in no position to respond. They were on the second floor of their firehouse, driven upstairs by the flood. Their fire trucks sat in four feet of water. All the radios were down, the phones dead. Only when the water went down a couple of feet could they drive to the fire. 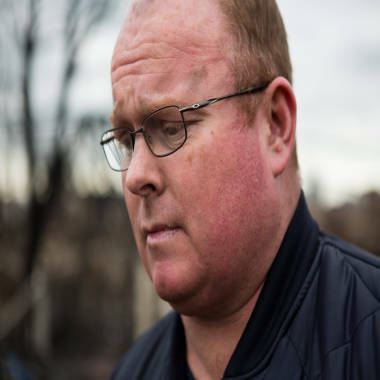 A fire marshal whose home is in the Wedge, Kieran Burke, said it was about an hour, after he first saw the glow and smoke, before anyone began fighting the fire. Even then, until about 11 p.m., he said, there was only one hose directed at it. The volunteers from Point Breeze rode to the fire in the bucket of a payloader tractor, fighting alongside the Rockaway volunteers and the paid professionals until 5 in the morning. At one point they worked especially hard to save a large tan house facing the ocean. That's Sheila Scandole's house. Her husband, Robert, was a stock trader with Cantor Fitzgerald who died at the World Trade Center, and they both grew up in Breezy Point. Kieran Burke, a fire marshal, surveys the burned-out remains of his Breezy Point home on Wednesday. He was nearby at his mother's home, which survived but was flooded, when the fire started. But the house of Sheila Scandole, the 9/11 widow, remained, scarred but standing, staring out at the beach and the calming Atlantic Ocean beyond.